August 28, 2018 / Modified sep 10, 2018 10:42 a.m.
Want to see the candidates for governor? Join AZPM in studio, Sept. 25! Victory went to incumbent Gov. 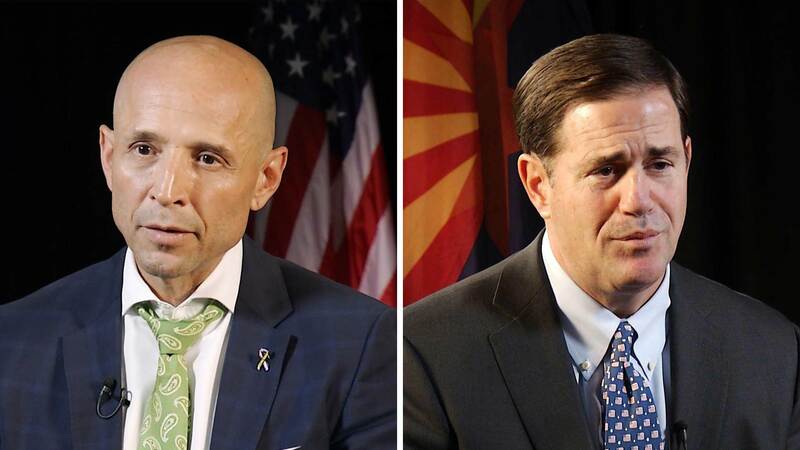 Doug Ducey over challenger Ken Bennett in the Republican primary, and Democratic candidate David Garcia got his party's nomination, both shortly after initial results started pouring in, according to the Associated Press. Ducey campaigned little in the primary, instead preferring to focus on fundraising and the general election. Bennett's campaign struggled to gain traction as Republican party officials pushed off from him. He spent the last hours of his campaign trying to get enough signatures to be awarded public campaign dollars. He said he would use the money to pay off campaign loans. Garcia ran for state superintendent of public instruction four years ago and lost. His campaign for governor focused on education getting a boost during the Red for Ed teacher strikes earlier this year. Garcia ran against Steve Farley and Kelly Fryer. Farley spent a decade in the Arizona Legislature representing Southern Arizona in the House and Senate. He was the fundraising leader during the Democratic gubernatorial primary, and spent time on the campaign trail talking about his breadth of experience. Democratic candidate Kelly Fryer moved into the public eye as the CEO of the YWCA in Tucson. She ran a grassroots campaign, often touting the tens of thousands of miles she put on her car criss-crossing the state. Republican challenger Steve Gaynor left little doubt that he was walking away with the nomination over incumbent Michele Reagan, according to initial results. Gaynor is a businessman who put $1 million of his own money into the race to unseat the incumbent. He owns a printing plant. Before being elected to the office four years ago, Reagan was a member of the state Legislature. Democrat state Sen. Katie Hobbs is the Minority Leader in the Arizona Senate. She has spent 25 years as a social worker. Visit our primary election results page for updated numbers on this race. Sandra Kennedy took one of the Democratic nods for Arizona Corporation Commission, according to the Associated Press, while Kiana Maria Sears and William Mundell were in a tight race for the second nomination. The Associated Press gave Republican incumbent Justin Olson the nod, though initial results showed a relatively close race among the rest. Two seats for the ArizonaCorporation Commission will be decided this November. Three Democrats and five Republicans were running for two spots apiece on the November ballot. Republican incumbents Forese and Olson — who was appointed to his seat — were seeking to remain on the commission. They were challenged by Rodney Glassman, James O'Connor and Eric Sloan. Kathy Hoffman took the Democratic nomination for superintendent of public instruction over David Schapira, the AP reported, while early results showed Republican incumbent was holding in the third position in close race to defend her seat. Four Republicans challenged Superintendent of Public Instruction Diane Douglas in a year that witnessed an unprecedented teacher walkout in the state over education funding. The five-way race was between Bob Branch, a professor of education; Jonathan Gelbart, a former BASIS Charter Schools official; Jonathan Gelbart, Tracy Livingston, former teacher and community college board member; and Frank Riggs, a former U.S. congressman from California, according to state candidate profiles. The two Democrats in the primary were Kathy Hoffman, a speech therapist and public school educator, and David Schapira, a school administrator and former state legislator.